KAE have undertaken designs for a number of school and leisure centre multi purpose halls. We see continuously, a rush to a neat solution of high level ductwork, served by large AHU’s with high outside air capacities. With some early analysis and options discussion with client, Architect and Engineer, often better and more economical solitons are available. The aim of this post is to indicate to designers that a simple high level air conditioning approach to large sports halls can miss many energy savings opportunities and provides for plant capacity overkill. As a minimum ask for/provide an AC options report detailing the pros and conns for high level AC vs Low level AC. One of the conns to be considered is additional co-ordination for ductwork etc. 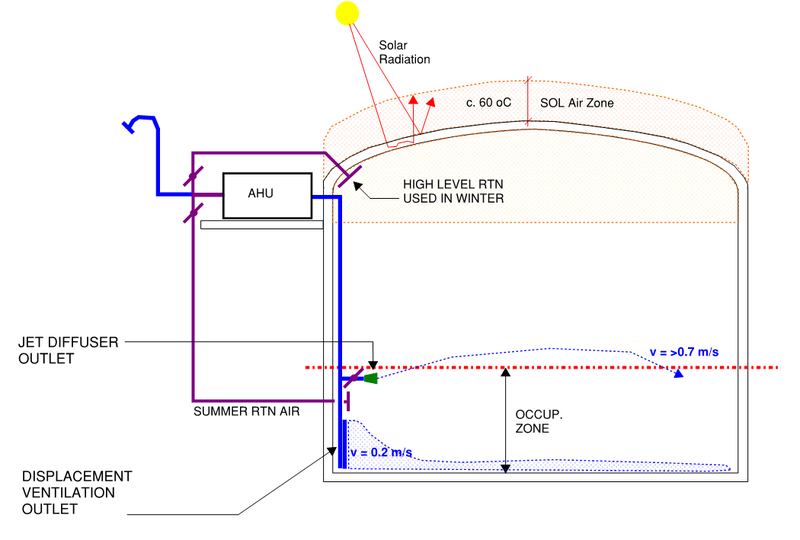 as shown in Diagram 5 – Enhanced AC – Schematic. Large sports halls, by their nature are large spaces, thus contain large volumes and associated large surface areas (walls, roofs, floors etc.). 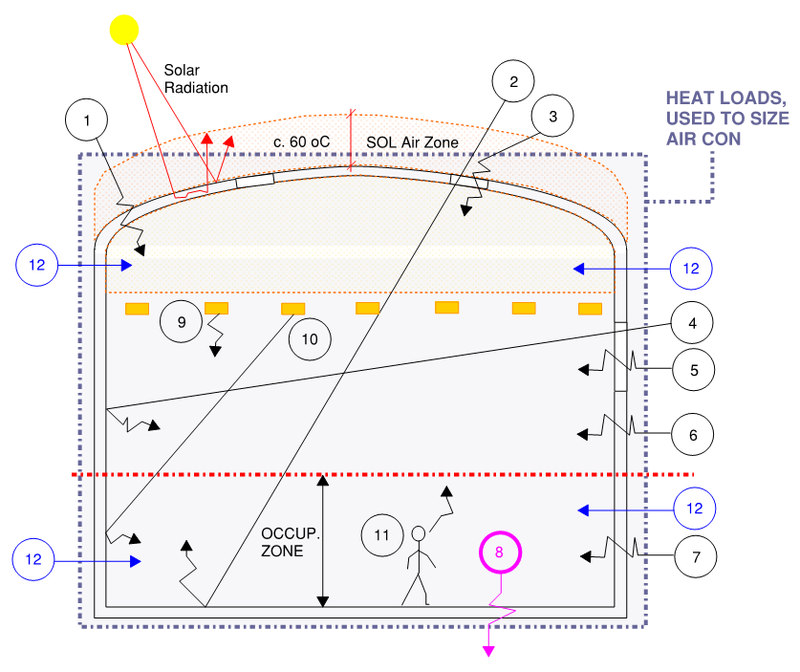 This ‘size’, when subject to external conditions creates large heat loads within the hall (See Heat Load section later). 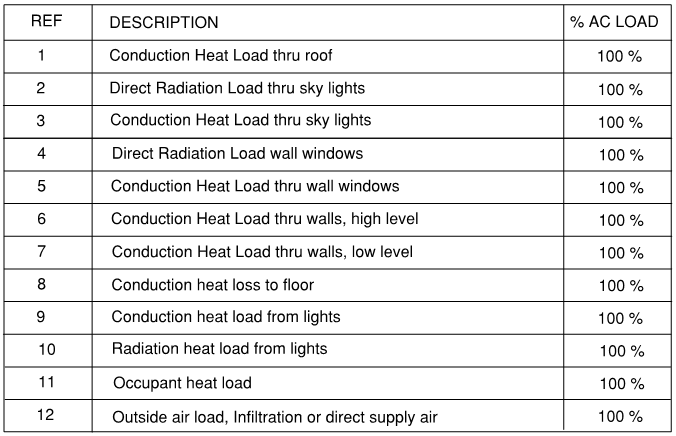 In addition to the above, internal loads and especially occupancy (including associated fresh air requirements) add more heat load. Sports Halls are typically multi use areas, thus occupancy can vary wildly from use as volleyball courts to use for school assembly. 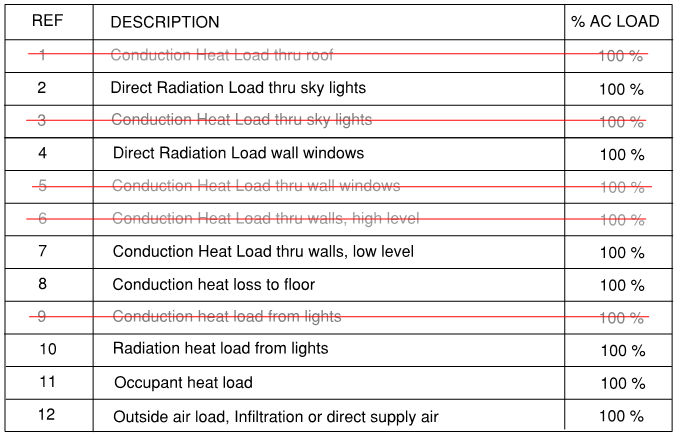 Thus, occupancies may vary from say 10 to 1000 occupants, with resultant incident heat loads. 3. Air Conditioning – Is It Needed? In the first instance, the need for air conditioning needs to be considered. If close control of internal temperatures is not required, then, coupled with ad-hoc low occupancy usage, natural ventilation in lieu of air conditioning often is all that is needed. 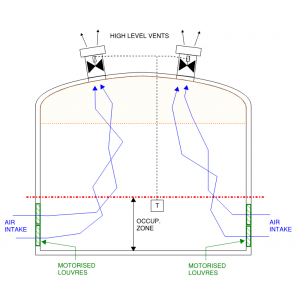 Consider low level air intake vents and high level motorised exhaust points. When is Air Conditioning Required? 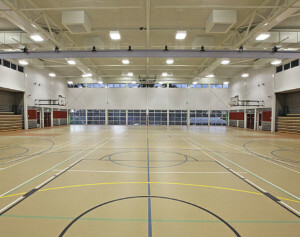 Hall is used, for long periods, where too hot or too cold, may affect occupants (examinations). Undertake winter, summer and mid-season analysis to determine if resultant conditions would be acceptable, without air conditioning. Consider air condition of the lower levels of the hall, only, thus avoiding all the high level loads that would impact high level air conditioning supply air systems. Where air condition is adopted…..
A common approach to air conditioning this type of space is the use of high level ductwork. A common approach is high level fabric ductwork. Involves the whole hall space, thus can dramatically increase air conditioning capacity. Poor air flow control in occupied zone, especially in heating mode. 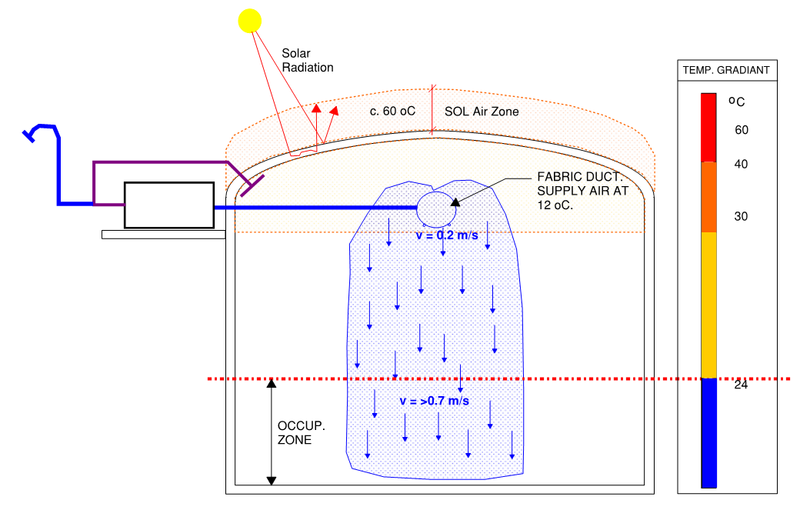 Fabric Duct is in high temperature high level zone, thus increased heat load (AC capacity). Assumption: Stand Alone, hall exposed walls and roof, high level supply air. Conventional heat loads, of the entire hall provides for large cooling loads. See below. 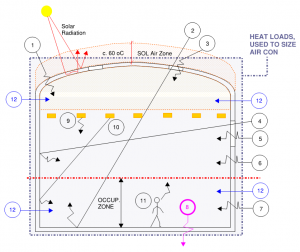 A method to reduce the cooling and heating requirements is to condition only the occupied zone (for example the lower 2.5 m of the space) and allow temperatures above this height to increase and be vented to atmosphere or used in winter pre-heating. 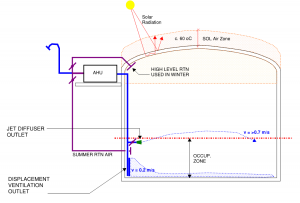 This approach will reduce the total cooling load.Note: NOT air conditioning the entire volume will significantly reduce plant sizes and running costs. To do this low-level air supply options are required. The above, indicates when air conditioning, of the occupied zone only occurs, significant reduction in cooling loads is achieved. 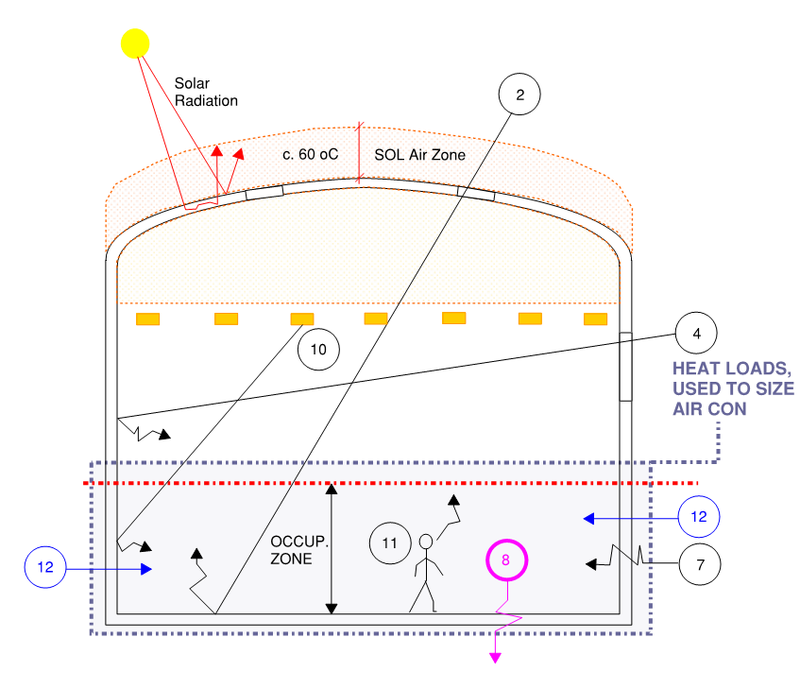 Note: Natural ventilation systems, in diagram 1, to be incorporated (Nat Vent Mode). Cooling and heating is often provided by air cooled package units, or air handling units (CHW and HW). These can include economy cycles (free cooling).A recent approach is to utilise Air Change type units, where the cooling capacity of the air-cooled package unit is reduced due to the incorporation of a heat exchanger to pre-cool incoming outside air with indoor air. This approach needs to be carefully assed. In halls that are operational for extended or 24-hour basis, then the hall temperature will be cool and thus can be used to reduce the capacity of the AC unit. However, on halls used ad- hoc, there is a risk that the hall temperature cannot be brought down, on AC unit start, due to warm hall temperatures and in sufficient AC capacity. 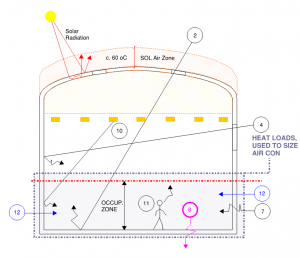 The NCC (BCA), part F4, determines the need for outside air (ventilation). 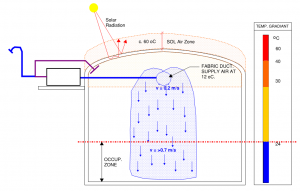 Natural ventilation can be considered if operable opening >= to 5% of floor area, is available. Minimum outside air design – cater for minimum occupancy, say 20 players/ court, including support persons. Let’s say 200 l/s of outside air. If occupants are in a space for < 30 minutes ventilation may be avoided, as per AS1668.2 (2012). AS1668.2 (2012), figure 2.3 – Permissible Lag Time – Hours allows for outside air supply to be delayed to a space dependant on the volume per person in the space. Modes 1 to 3, assuming 10 l/s per person as normal occupant fresh air rate, would delay the need for outside air by 10 hours. Thus in reality, not required, or flush the room every 10 hours. With mode 4 the outside air supply could be delayed for circa ¼ hour. Interestingly empirical data (CIBSE Guide) for large halls indicates typically infiltration at a rate of 0.25 ac/hr occurs. This represents 2235 l/s of outside air. Assuming 10 l/s per person as normal occupant fresh air rate, would allow circa 225 occupants without mechanical outside air supply (i.e. modes 1 to 3). The energy saving requirements of the NCC for outside air are not robust enough, allowing this type of project to, if desired, avoid outside air control. Given the vast majority of the time this type of space will be sparsely occupied (as compared to the maximum occupant loading) it would be ‘energy shameful’ to supply outside air at a rate suitable for 2400 occupants all year round, based on fan power alone. 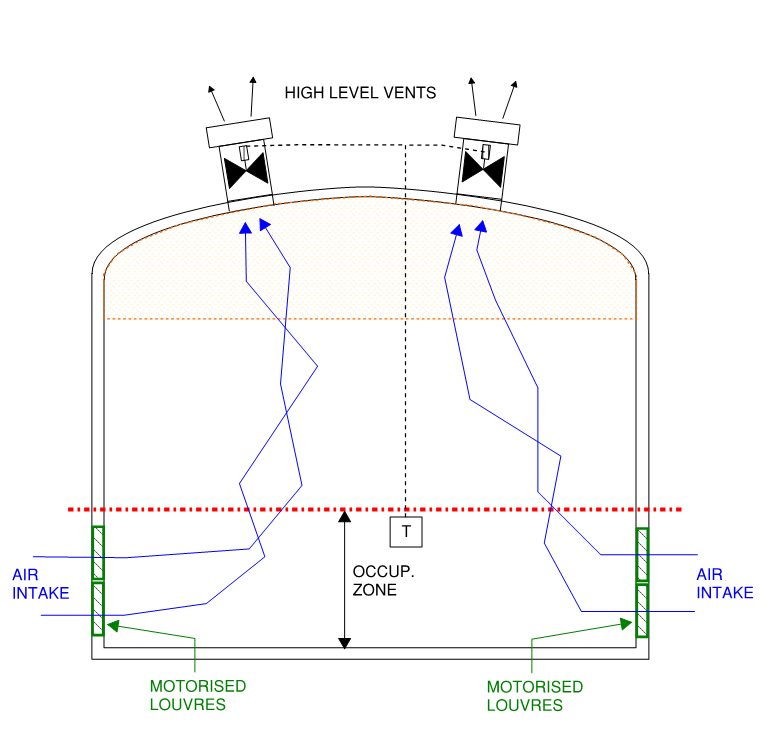 The usage of sports halls provides for an erratic outside air need, if used for sports, assembly & functions.Typically, minimal outside (modes 1 to 3) air is required and this can be provided via infiltration leakage. Separate outside air supply via air handling units is not required (assumes outdoor air is clean and of good quality). With occupancies at circa 100 m3 volume per person (c. 320 occupants) outside air supply can be delayed by circa 5 hours (As per AS 1668.2 (2012)). After this period outdoor will be required/a building flush. During high occupancies, if no internal condition control is required, the space can be naturally ventilated. For maximum occupancies (2400 occupants), utilise a mixture of temperature drift and low level AC to avoid high level incident heat loads. Note: Resulting room humidity has not been considered, in this post.